This interview was originally published in WODTalk Magazine (2012 CrossFit Games Cover Story) but with the 2015 CrossFit Games about to start, and with the Paleo more popular than ever, I felt like the content was still super relevant. In preparing this interview for re-release, I also found this interesting mention of the original WODTalk version of the interview on the blog Carrotsncake.com. The blogger, Tina, was inspired by Julie's desire to connect modern medicine with proper nutrition and asked her readers what they thought about the Thomas Alva Edison quote. It got quite a few replies which you might enjoy reading here. If you're a CrossFitter, a runner, or a regular old exerciser, and you eat Paleo, I'd love to hear how Paleo has changed your life as well. For most people, attending medical school is a full time job. For Julie Foucher, however, it’s just a warm-up. 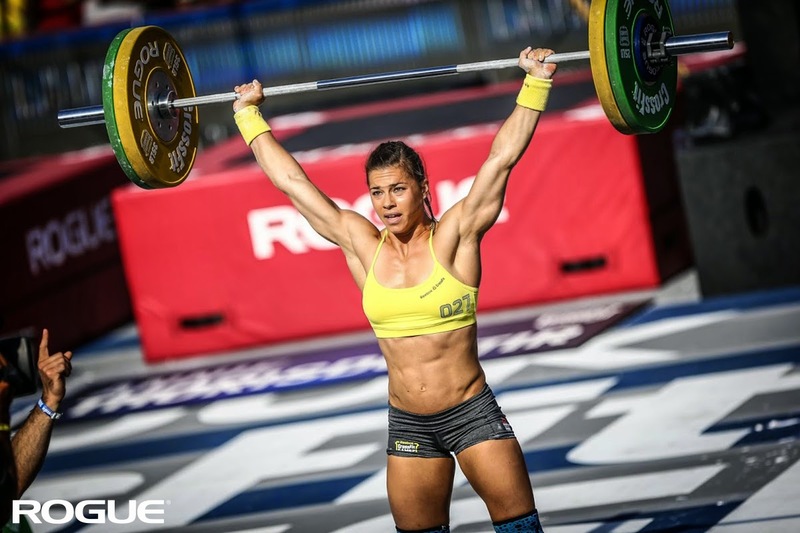 She’s a seasoned CrossFit Games competitor and has been dubbed “The Silent Beast” for her humble demeanor and devastating athletic ability. I sat down with Julie to talk to her about the Paleo lifestyle and how it has made this already impressive athlete even more formidable. Tony: So, which came first, Paleo or Crossfit? Julie: Definitely Crossfit. I started Crossfit about three years ago and my diet at the time was more Zone-like than Paleo. I never measured any of my food, but I was cognizant of keeping a balance between protein, carbohydrates, and fat. I would eat things like pizza or have a bagel for breakfast though and that’s how it stayed for about 2 ½ years. This past January I had dinner with some friends who were very into Paleo, so I went home and started looking at some stuff online. I figured that it shouldn’t be so hard to stick with it for a month and my boyfriend even decided to do it with me. How did you feel when you first made the switch? I was expecting to feel a lot worse, but it wasn’t so bad. The biggest thing was taking out dairy. I love dairy (laughs)! There were a few days when I felt sluggish during my workouts, but after about the second or third week I started to notice some changes, but in a good way. Now, I just feel better all day. I have more energy and don’t get tired or sluggish after eating a meal. In my workouts it’s like I have this little extra something that helps me to push harder, like there’s a little something more. Obviously you stuck with Paleo past the “30 Day Trial”. Have you had to make any adjustments to your diet since then? Honestly, I think that it’s going to be a constant process of modification because I don’t think I have it completely dialed in. I would like to experiment with the amounts of food that I am eating as well as playing with different levels of macronutrients because I haven’t really done that yet. Even though I really love dairy, I have not felt the need to add it back in. For my mental sanity, I eat a lot of really dark chocolate or maybe put some heavy whipping cream in my coffee once a week. Are there any particular Paleo foods that you find especially helpful for athletic performance? Protein is huge. I also tend to eat a lot more sweet potatoes than someone who isn’t working out would need, but other than that, I don’t see a whole lot of difference. What kind of protein do you go for? At the beginning I wasn’t so concerned about what type of meat I was eating, but I’m starting to feel like the lean meats are actually better. I have been eating more bacon just because it is delicious. I’m also starting to think a lot more about the quality of my foods and to try and get more organic and grass-fed meats. Do you feel the need to change your diet as you get closer to competition now? All I’ve really been doing is to try to be more dialed in with Paleo. When you’re traveling, how well are you able to stick to the Paleo lifestyle? It’s actually not that hard. I eat a lot of Steve’s Club Paleo Kits. I eat those even when I’m home and in a rush. It might not always be “perfectly Paleo” but wherever you go there is always something Paleo you can get. For instance I was at a bar with some friends and just ordered a plain burger and a salad with some olive oil and vinegar. It was pretty Paleo and it was pretty good! If you can go to a bar and find something Paleo it can’t be that hard. Sometimes you might have to be annoying to the waitstaff (laughs), but if you can get past that it’s not too hard. How do you handle your grocery shopping? I usually do a combination of Costco and the farmer’s market. Costco purely because of quantity! There is also the Westside Market here in Cleveland and they sell everything. I usually just buy a lot of meat, fruits, and vegetables and cook once a week. I recently bought a grill and have just been grilling everything. It’s really awesome (laughs). I think that cooking once a week really helps. I even found a recipe where you put eggs and other things into muffin tins and bake them ahead of time, that way you always have something ready for breakfast. I use a lot of tupperware and store my food in the fridge at school. I noticed that you had a Thomas Edison quote on your blog where he describes the doctor of the future as treating patients by instructing them “in the care of the human frame, in diet, and in the cause and prevention of disease.” Is that what you envision for yourself when you graduate? I love that quote, I heard it during a lecture this year and think that it highlights how important prevention is and how many problems could be avoided by living a healthy lifestyle. At this point I don’t know what kind of medicine I want to practice, but I want to incorporate CrossFit, nutrition, and Paleo into it. Are there any Paleo books or blogs that you’ve found helpful? I’ve found recipes on sites like FastPaleo.com but honestly haven’t had time to do a lot of research. I have a month off and that’s on my to-do list. I’m really looking forward to learning more about it. I’m also planning doing a nutrition masters which I think is important because in med school we don’t really get a lot of that. I think it’s going to be really interesting learning about Paleo and the things we talk about in Crossfit and to try to make sense of it all. Do you have an ultimate Paleo meal? Probably some combination of steak and seafood, grilled asparagus, salad and sweet potato fries. I’ve been really into grilled asparagus lately (laughs). What would you say to someone who is just starting out with Paleo or CrossFit? I would say to just stick with it and give it time. It can be really frustrating in the beginning, not making progress right away or not making progress in the way you would like to. What helped me was the idea of “give it 30 days”. I say give it time, let your body adjust and have patience.